You are here: Home / Climate / "The Cold Sun"
The Sun will be playing a “starring” role in the climate over the next few decades, if predictions of a forthcoming solar decline are proved correct. This is going to be a very interesting time for all sides of the climate debate, because when the Sun decides to take it easy for a few years, it will, with luck, demonstrate clearly the magnitude of the effect the our nearest star has on our terrestrial climate, and how it compares to that of man-made greenhouse gases. As we have seen, the AGW consensus team (“The Cause”) like to assure us at every turn that the only mechanism by which the Sun can alter the climate is by means of changes in solar irradiance. Earlier this week, the Met Office insisted that a predicted reduction in solar output over the next few years would be too small to offset greenhouse gas warming. IPCC AR4 dismisses solar irradiance changes as too small to have any significant effect on our climate, but at the same time rates understanding of indirect solar effects as “very low”. Despite this, AR4 was still able to claim that “most of the observed increase in global average temperatures since the mid-20th century is very likely due to the observed increase in anthropogenic greenhouse gas concentrations” (Summary for Policymakers, p10). How the IPCC could have made that leap of faith is a matter of political expediency rather than scientific certainty. But that’s the IPCC for you – a political organisation making political statements. Svensmark and Calder’s “The Chilling Stars” (Amazon link) set the scene for novel mechanisms by which the Sun could modulate the Earth’s climate, apart from the traditional method of changes in solar irradiance. The most prevalent of these is modulation of cosmic rays via solar wind. Put simply, increasing solar wind from an active Sun shield the planet from galactic cosmic rays (GCR), resulting in a reduction in cloud cover and consequent increase in global temperature. Conversely, when the Sun is dormant, the reduced solar wind allows more GCR, which act as cloud formation nuclei, thereby increasing cloud cover and reducing global temperature. Recent experiments at the CLOUD facility have confirmed that the mechanism appears to have a basis in science. Now we have articles appearing which indicate that Solar Cycle 25 could be the smallest in 300 years. If this were indeed the case, we could be looking at a “Grand Minimum” like the famous Maunder Minimum in the 17th century, during which the River Thames regularly froze and fairs were held on its icy expanses. The IPCC is certain: global warming is man-inflicted. But are the infamous greenhouse gases indeed primarily responsible for our climate? And why is it not warmer? Vahrenholt and Lüninghave in the course of their studies intensively engaged with the different climate models. They come to the conclusion that global warming over the past 150 years is part of a natural cycle that is characterised primarily by the sun. The next decades will likely lead to a slight cooling rather than further heating. This provides time to develop renewable energy sources focused and make this change in an economically rational and sustainable manner. Let’s hope for an English version sometime soon. 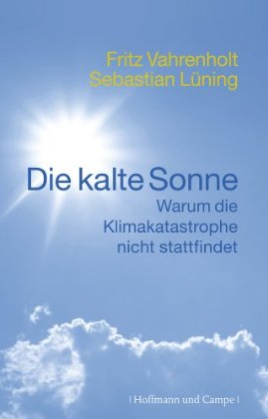 One thing is certain – if there is a solar decline as predicted and temperatures are unmoved as a result, we must accept that it is therefore more likely that the GHGs were the dominant cause of the modern warming. However, if temperatures fall significantly, then The Cause will have some serious thinking to do. Don’t panic they can give us government money to produce CO2, thats if they really care about the temperature of the planet and not just taking tax and freedom away! Warmists like to dismiss sceptics with the phrase “The science is settled.” This is about as factless as the argument “Your wrong and I’m right”. The science is far from settled, the science is so far from settled it’s probably on the completely wrong track. Take the shift in Earths magnetic field for example: the North magnetic moves 55-60 km per year, and the South by 10-15 km. The position of Earths magnetic poles will affect the concentration and location of the solar wind around the planet. This in turn effects the cosmic rays which in turn effect cloud formation. A cloud over land will have a different effect than a cloud over sea, because the oceans and land have different albedo. Have the IPCC even considered the shift of magnetic field over the past few decades… I don’t think so. The shift of the North pole could even be the sole reason for a melting Arctic, and have nothing to do with CO2. Don’t tell me the science is settled! This is news in the British Press and the Russian scientists predicted it also last year. As I see it, it is yet another Inconventient Truth…… poor Al. I am not a scientist but I am truly fed up with all the hype being pushed down our throats about climate change, rising seas, higher temperatures etc. Have any of the so call know it all’s taken a step outside lately and checked the strange things the climate is doing? I must admit I love reading these Inconvenient News Items, many of which you have to go actively searching for, because the Lame Stream Media is discouraged from telling you about them. It is more than the World Currency which will be freezing me thinks. Clearly the coming ice age will be man’s fault because we haven’t worshipped the sun god. Don’t worry, a new tax will fix everything. Don’t forget that the shifting of the magnetic poles and natural variation are also causing a reduction in the planetary magnetic field. At present, the overall geomagnetic field is becoming weaker; the present strong deterioration corresponds to a 10–15% decline over the last 150 years and has accelerated in the past several years; geomagnetic intensity has declined almost continuously from a maximum 35% above the modern value achieved approximately 2,000 years ago. This reduction will only magnify the effect on the atmosphere since it will combine with the solar activity to further increase the intensity and depth of penetration of all forms of ionizing radiation from space.